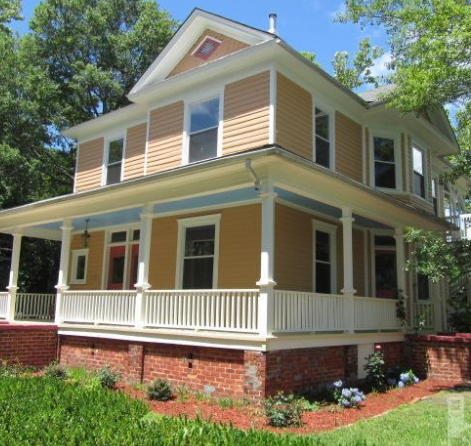 Carolina Place is a historic community in Wilmington, North Carolina that dates back to the early 1900s. The town was originally built as a streetcar suburb and is a national register historic district. The community features gorgeous historic homes among huge oak trees, as well as azaleas and dogwoods that bloom in the spring. Although many homes at Carolina Place have been renovated, many retain some of the original charming features such as brick fireplaces, front porches and exterior details. The architecture of the homes in the community ranges from Dutch Colonials to Craftsman style bungalows. Carolina Place is bordered by Market Street, Burnt Mill Creek, Gibson Avenue and Wrightsville Avenue, with downtown Wilmington just a short drive away. The surrounding neighborhoods are Forest Hills, Ardmore, Carolina Heights and Brookwood. Both Brookwood and Forest Hills offer wonderful walks where residents can enjoy gorgeous trees and breathtaking homes. In addition, Carolina Place is situated about 20 blocks from the historic Cape Fear River, and residents often ride bikes. Carolina Place is an ideal location for residents who enjoy being close to coffee shops, restaurants, galleries and theatres. Carolina Place is located in the New Hanover County School District, which serves nearly 40 schools in and around Wilmington. Forest Hills is the closest elementary school to Carolina Place, which is a wonderful school situated at the top of a hill surrounded by giant oaks. The New Hanover County School District public elementary schools are Alderman, Anderson, Bellamy, Blair, Bradley Creek, Carolina Beach, Castle Hayne, Codington, College Park, Eaton, Forest Hills, Holly Tree, Murrayville, Ogden, Parsley, Pine Valley, Sunset Park, Williams, Winter Park, Wrightsboro and Wrightsville Beach. The New Hanover County School District public middle schools are Holly Shelter, Lake Forest Academy, Murray, Myrtle Grove, Noble, Roland-Grise, Trask, Virgo Preparatory Academy and Williston. The New Hanover County School District high schools are Ashley, Hoggard, Isaac Bear Early College, Laney, Mosley Performance Learning Center, New Hanover and Wilmington Early College. Carolina Place residents have access to the Cape Fear Public Transportation Authority, which operates as ‘Wave Transit’ and provides a variety of public transportation options including fixed route bus, shuttles and a free downtown trolley. Bus Route 105 is the most convenient stop for Carolina Place, with a stop at the intersection of Market Street and 19th Street. Carolina Place is an extremely friendly community, often described as “front porch living” at its best. This provides plenty of opportunities for new residents to meet their neighbors. Special events take place throughout the year that brings the community together for celebrations. For example, on the Fourth of July, residents get together at Burnt Mill Creek and at Christmas many residents open their homes to offer food and drink. In addition, each Wednesday at 3:30 in the afternoon, parents take their children to play at the local park.